Pin It Now! 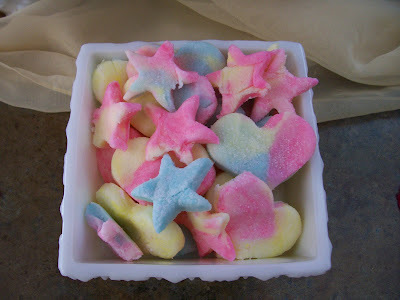 I made these sweet, little treats for a "fairy party" I hosted for my 4 year old daughter and her cousin. **Mix softened cream cheese and powdered sugar with an electric mixer. Add mint extract to dough. Knead dough until it begins to form a ball and is the consistency of pie dough. If dough is too dry, add 1/4 tsp. water and blend into mixture. 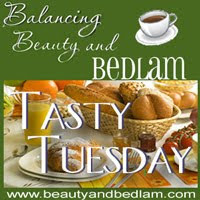 For more great recipe ideas visit Balancing Beauty and Bedlam. Also linked to Tempt My Tummy Tuesday. Those look great! My daughter wants a fairy b-day party and these would be a addition. Thanks for sharing! Those are adorable! And they look tasty, too. So perfect and glittery for a fairy party! I love cream cheese mints, and these are extra cute! Thanks for sharing! Your mints look so pretty, and they sound absolutely delicious! These are darling! Would be great for a wedding or baby shower, too! I just love how you designed these with the pretty colors and fun shapes! Those are so cute! My girls can't wait to make them!